Protecting your hands with a pair of high-quality cold-resistant gloves is an important first step towards staying warm and comfortable when working outside, but there's more you can do to maximise your well-being. The Hotteeze for Feet Self-Adhesive Heat Pads (Pack of 5) are the ideal remedy for cold feet wherever you are. The self-adhesive heating pads easily and discreetly fit into most shoes, where they provide comforting heat for up to five hours. 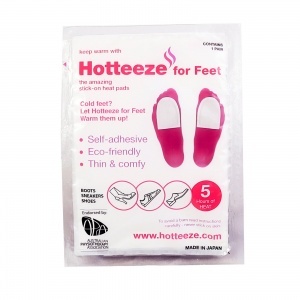 The Hotteeze for Feet Self-Adhesive Heat Pads are supplied in a pack of five pairs. They are also available for purchase in single pairs.